The Catholic Church has 1.1 billion adherents worldwide, representing half of the global Christian population. Brazil has the world’s largest number of Catholics (134 million). There are more Catholics in Brazil alone than in Italy, France and Spain combined. 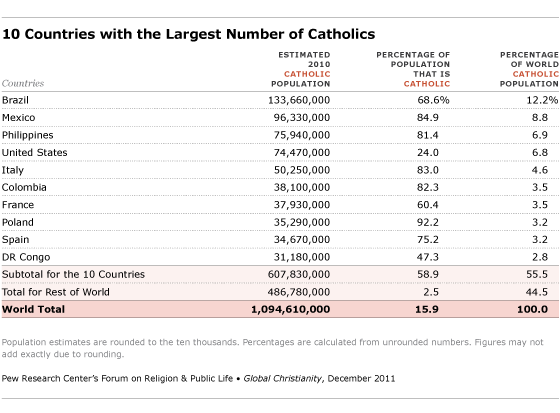 The 10 countries with the largest number of Catholics contain more than half (56%) of the world’s Catholics. Most of the countries with the largest Catholic populations have Catholic majorities. But the United States has the world’s fourth-largest Catholic population even though only about one-in-four Americans is Catholic. There are 67 countries in which Catholics make up a majority of the population. More than 70% of Catholics live either in the Americas (48%) or in Europe (24%). Almost 40% live in Latin America alone. 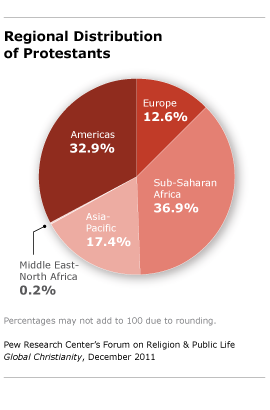 More than a quarter live either in the Asia-Pacific region (12%) or in sub-Saharan Africa (16%). The world’s 801 million Protestants, as broadly defined in this report (see Defining Christian Traditions), make up 37% of the global Christian population. The Protestant Reformation, which split Western Christianity and gave birth to Protestantism, took place in Europe in the 16th century. Today, however, only two of the 10 countries with the largest Protestant populations are European. 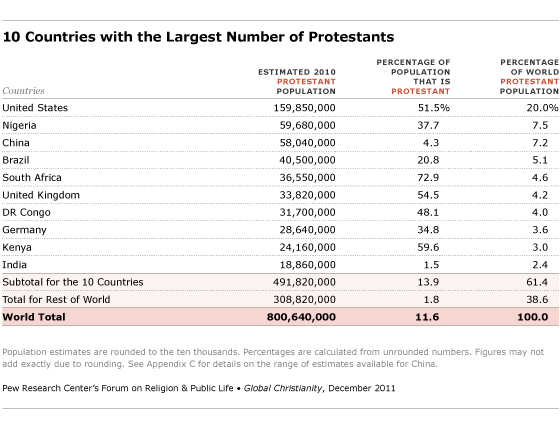 The 10 countries with the largest number of Protestants collectively account for 61% of the world’s Protestants. Protestants form a majority of the total population in 49 countries. Despite Europe’s historical links to Protestantism, its share of the global Protestant population (13%) is eclipsed by the share in sub-Saharan Africa (37%), the Americas (33%) and the Asia-Pacific region (17%). Only the Middle East-North Africa has a smaller share of Protestants (less than 1%) than Europe. There are about 260 million Orthodox Christians, making up 12% of the global Christian population. Nearly four-in-ten Orthodox Christians worldwide (39%) reside in Russia, the country with the largest number of Orthodox. Ethiopia has the second-largest number of Orthodox Christians and more than three times as many Orthodox as Greece. Although Turkey is the seat of the ecumenical patriarch of Constantinople, one of the highest archbishops in Orthodox Christianity (see Defining Christian Traditions for details), its Orthodox population is relatively small (about 180,000). Nearly nine-in-ten (87%) of the world’s Orthodox Christians can be found in the 10 countries with the largest Orthodox populations. Most of the countries with large numbers of Orthodox Christians have an Orthodox majority – though the Orthodox make up less than half the total population in Ethiopia and only about 5% of the population in Egypt. (See spotlights on Ethiopia and Egypt.) 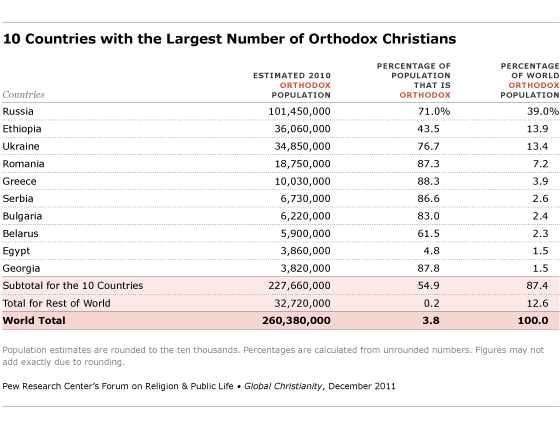 Orthodox Christians make up a majority of the total population in 14 countries. The Orthodox Christian population is heavily concentrated in Europe, which, for the purposes of this report, includes all of Russia. Europe is home to 77% of the global Orthodox population. 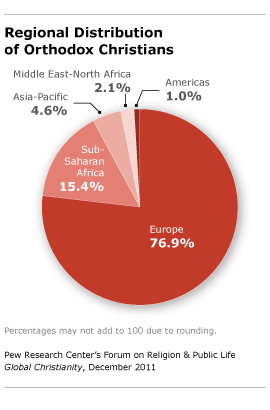 Sub-Saharan Africa has about 15%, and the Asia-Pacific region (including Turkey) has roughly 5%. Small shares of Orthodox Christians also are found in the Middle East-North Africa (about 2%) and the Americas (1%). 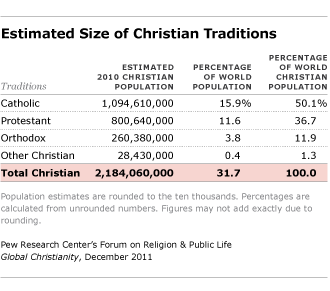 There are about 28 million Christians in the world who do not belong to the three largest Christian traditions. 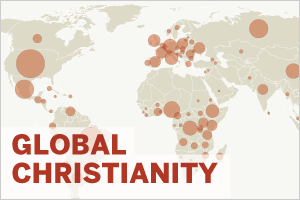 Those belonging to other Christian groups make up slightly more than 1% of the global Christian population. Many of the other Christian groups, including the Church of Jesus Christ of Latter-day Saints and Jehovah’s Witnesses, began in the United States. Today, the United States is home to 37% of other Christians, although only about 3% of Americans belong to these groups. 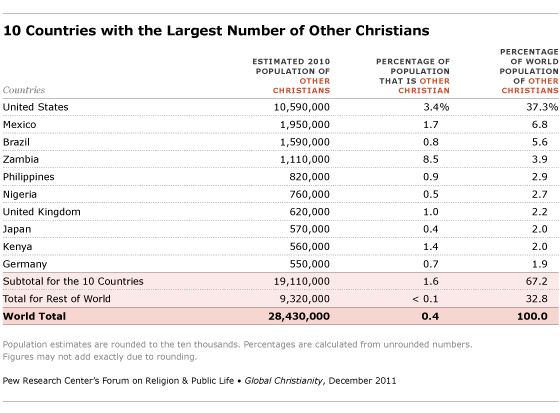 About two-thirds (67%) of all other Christians live in the 10 countries with the largest number of other Christians. 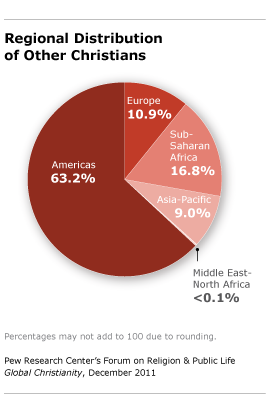 The majority of other Christians live in the Americas (63%). 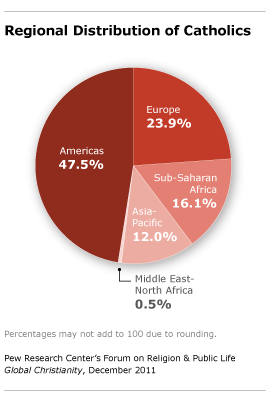 Smaller shares of other Christians live in sub-Saharan Africa (17%), Europe (11%) and the Asia-Pacific region (9%). Less than 1% of other Christians live in the Middle East-North Africa. Estimates for the number of Catholics in this report also include members of some relatively small Catholic groups (such as the Brazilian Catholic Apostolic Church) that are not in communion with the bishop of Rome. The third group broadly defined as Protestants in this report is independent Christians. Independent Christians have developed ecclesial structures, beliefs and practices that are claimed to be independent of historic, organized Christianity.10 Independent Christians include denominations in sub-Saharan Africa that identify as independent from historically Protestant denominations, churches in China that are not affiliated with official religious associations and nondenominational churches in the United States. Orthodox Christians are members of self-governing churches that belong to the Eastern Christian tradition. In 1054, the Great Schism divided the Christian church into an Eastern, Greek church centered in Constantinople (Istanbul today) and a Western, Latin church centered in Rome. This formalized a cleavage that had been growing for centuries. A major source of division was that the Eastern church did not recognize the bishop of Rome’s claimed jurisdiction over the entire church. The Eastern insistence on ecclesial autonomy persists: Orthodox Christianity is organized into “autocephalous” churches, each under the leadership of its own supreme patriarch. Members of other Christian groups self-identify as Christian although older Christian traditions may view them as distinct from mainstream Christianity. Many of these groups – including the Church of Jesus Christ of Latter-day Saints (Mormons), Jehovah’s Witnesses and the Christian Science Church – originated in the United States. These groups often depart from traditional Christian beliefs with respect to the trinitarian nature of God and have additional sacred texts beyond the Christian Bible and/or their own authoritative interpretations of the Bible. For example, the canon of the Mormon church includes four texts: the Bible (both Old and New Testaments), the Book of Mormon, the Doctrine and Covenants and the Pearl of Great Price. Jehovah’s Witnesses believe that “Christ is God’s Son and is inferior to Him” as well as that the destruction of the present world system at Armageddon is imminent.15 They prefer their own Bible translation, the New World Translation of the Holy Scriptures.16 Christian Science was founded by Mary Baker Eddy (1821-1910). Her 1875 book, Science and Health with Key to the Scriptures, is one of its central texts, along with the Bible.17 Other groups in this category include the Unification Church, Swedenborgians and Christadelphians.